Are you the owner of an Invisible Fence® brand system? Doody’s Dog Fence is dedicated to providing our customers with outstanding customer support and keeping pets safe – now, we extend the same services to you! Though we are not associated with Invisible Fence®, we can provide independent support for Invisible Dog Fencing® systems, and most other electric pet fence systems such as DogWatch, Dog Guard, Innotek, etc. We can repair wire breaks and exposed wires, or provide troubleshooting support and general maintenance. Contact us today to find out how Doody’s Dog Fence can help keep your Invisible Fence® functioning and your pet safely and securely contained! If you’re a current owner of an Invisible Fence® or other brand of dog containment system, you’ll be happy to hear that you can upgrade to a premium Pet Stop system at reduced price when you swap out your existing system. Inquire now! 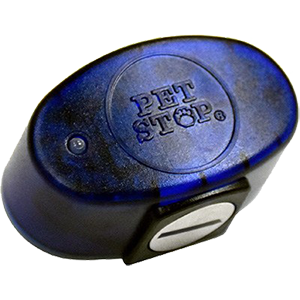 Our Pet Stop® receiver collars can be programmed to work with Invisible Fence® (as well as other electronic pet fencing brands), and for people who already own an Invisible Fence® underground pet fence system, we have Invisible Fence® compatible batteries and receiver collars. Doody’s Dog Fence and Perimeter Technologies are not associated with Invisible Fence®, Dog Guard®, Dog Watch® or PetSafe®. These trademarks are the property of their respective owners.